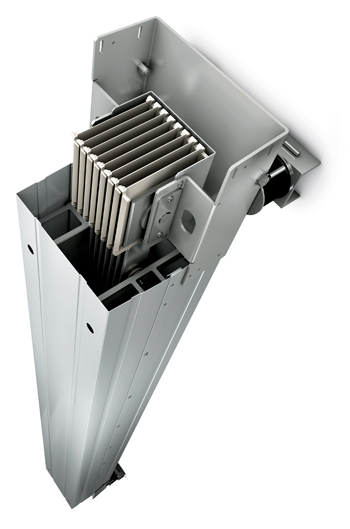 Siemens has developed a new air-insulated busbar trunking system that increases the efficiency and reliability of wind turbines. The LDM system from the Sivacon 8PS product family will replace cables for transmitting power from the generator to the grid infeed. The fast, cost-efficient installation and the increased efficiency with less power loss make construction as well as operation of a wind turbine more efficient and profitable. The low fire load achieved by not using plastics and standards-compliant design verification increase the turbines’ operational safety. The system is now designed for a rated current of 800 to 8,200 amperes. The new maintenance-free and fail-safe busbar trunking system is an enhancement of the existing LD system. Optimised cross-sections enabled the efficiency to be significantly improved, which in turn decreases power loss. This means additional feed-in compensations for the plant operator throughout a wind turbine’s service life. In contrast to using cables, the LDM busbar trunking system can be pre-installed in the individual tower segments during the construction phase, which saves both time and costs. As the wind turbine is assembled, the individual busbar elements of the various segments are connected by a segment connector using a standard tool and only one bolt. The substantially wider fixing distances compared to cable installations speed up the installation of the new system and reduce the space and material needed. Thanks to a special design of the busbars, manufacturing tolerances can be compensated at the tower’s segment transitions; joint brackets with damper elements protect the system in case of tower movements. The LDM busbar trunking system meets the new IEC 61439-1/-6 standard that requires design verification of the system. This ensures that the specified technical parameters are permanently fulfilled. Further parameters, such as the required short-circuit ratings, can be easily met by means of suitable dimensioning and engineering. If needed, the system can be connected directly to the switchboard at the base of the tower and via separate cable infeeds to other equipment and to the loop cable. The LDM busbar trunking system satisfies an IP21 degree of protection and is thus suited for use in moisture- and salt-laden air.